Alex Raine Writes: Get Published! I don't see what is so hard about it? I mean I get published almost everyday here on Alex Raine Writes! All I do is write some clever and compelling script. My personal editor then checks the spelling and grammar. Although it does not do a good job of that; I still see errors. 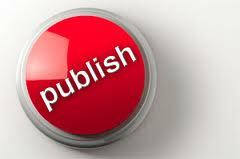 Anyways, so I write and then I have a magic button on my screen that reads "Publish" and I just press it. Voila! I am an author. Ok, seriously speaking. If you are a writer then blogging should be a natural progression for you in terms of getting your work seen by others and finding an audience. In this age of instant Youtube sensations, you could be the next viral hit. So I encourage you all to write and share. Wattpad is a unique platform for this exact purpose. You can share your 'works' and get feedback, critiques, encouragement from people across the globe. You could even be lucky like fellow Wattpadder Abigail Gibbs who recently landed a 6 figure deal with publisher Harper Collins!